Maybe you’re not thinking about holiday card ideas quite yet, but our busy little elves have been working on our new collection and we can’t wait to show you! Here’s a sneak peek to put you in the mood. Watch for our new Christmas cards sometime in August. 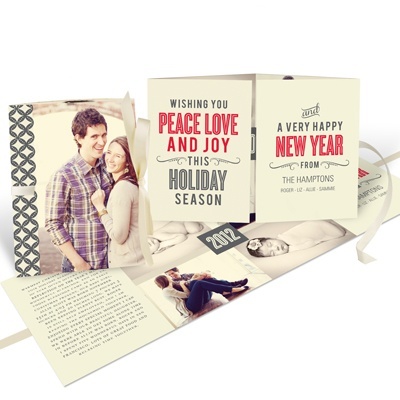 These photo holiday cards deliver a one-of-a-kind look in an even more unique layout, so if you’re looking to stand out this season, this card was made for you! Favorite photos, a poster-like holiday greeting, unique diamond designs and room for a custom Christmas letter are all folded up and tied with ribbon so loved ones can open it to reveal plenty of Christmas joy. Top off the customization with your choice of colors to accompany the ecru background. The holidays are filled with plenty of cheer, so why not share your cheer with loved ones? 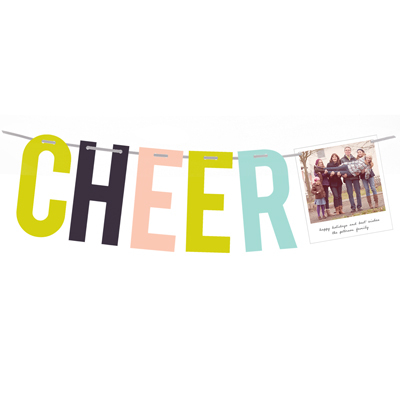 These holiday photo cards make the message loud and clear in a unique way with individually cut-out letters spelling Cheer that all string together to hang on a tree or from a mantel. A Polaroid-style photo strung on the end adds personalization, while the back side of the letters holds angled stripes in fun colors of green, aqua, pink and black to add trendy style. The Christmas season is filled with so many different memorable phrases, so why not share one with family and friends? 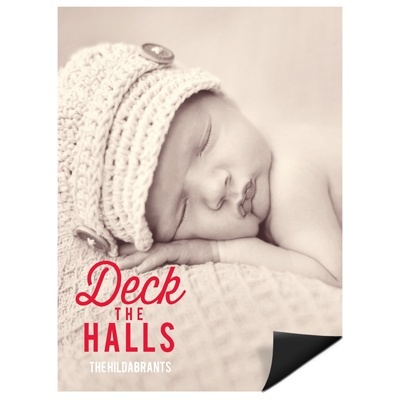 Merry and Bright, Deck the Halls and Oh What Fun flow off the tongue all season long, so choose your favorite and send one of these vertical Christmas photo magnets. Best of all is the personalization – your favorite photo and your choice of text color!